Jean-François his currently working on his Ph.D. thesis at the University of Alberta under the supervision of Dr John Waldron. Immediately after receiving his Bachelors in Environmental Geology from the Université du Québec à Montréal (UQAM) in 2005, he started a M.Sc. project in Geology at the University of Alberta. He then successfully transferred to a Ph.D. level in the summer of 2006. 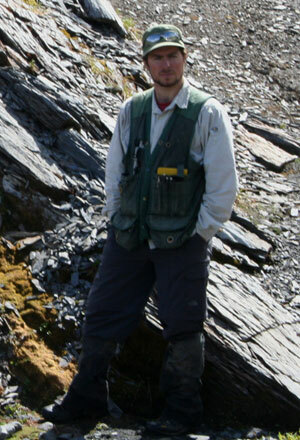 His research interests include structural geology, sedimentology, stratigraphy and basin analysis. He was also involved in a Quaternary mapping project with the Geological Survey of Canada near Baker Lake Nunavut in 2004. My project consists of evaluating the timing and nature of subsidence of the Jurassic-Cretaceous Bowser Basin in northwestern British Columbia. By looking at the early stratigraphic record at the base of the succession, I hope to improve constraints on the tectonic setting that led to a change from a volcanic dominated environment to a subsiding sedimentary basin during terrane accretion in the middle Jurassic. Understanding the basin forming mechanisms for the Bowser Basin is critical in order to evaluate the petroleum potential properly. Incorporation of fieldwork observations along with maturity data, such as vitrinite reflectance, will allow the construction of a calibrated basin model using the software PetroMod to understand the burial history of the Bowser Basin. The essential elements and processes of a petroleum system such as source rock, reservoir rock, seal rock and trap formation will be tested against the calibrated model in order to investigate the generation-migration-accumulation of petroleum. The aim of this research is to provide fundamental inputs for modelling the subsidence and thermal history of the basin, aimed at improving understanding of basin development, and basin evolution.